Thankfully, we were able to get a hold of an DXRacer FH11NB chair before they were sold out again. 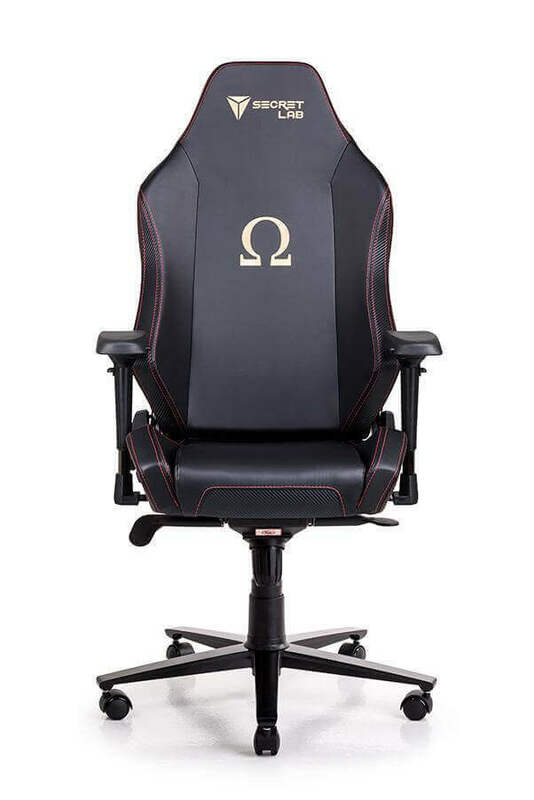 Sure, DXRacer is always on top of restocking their products from Amazon but it’s hard to get a hold of one of these things due to how popular they are and how much people love them. The DXracer Office Chair doesn’t look like anything special, so why are they so popular? DXRacer’s made quite the name for themselves amongst gamers, simply because they’ve been practicing quite a lot of organic marketing. They like to sponsor big and small game streamers alike, giving them their chairs while asking for very little in return. The chairs themselves are incredibly comfortable and pretty impressive, visually. It isn’t hard for streamers to recommend DXRacer chairs to their fans. The FH11NB retains all of those exceptional qualities that DXRacer prizes so much. They’re the same values that their fans all over the world love them for. The FH11NB is DXRacers answer to those who want those same qualities, but don’t want any of the other over the top features that most of their other chairs come with. The design of the DXRacer Gaming Office Chair is pretty happening and there’s a lot going on. This chair also has a nice smooth combination of both vinyl and mesh material on the exterior which makes for not only a stylish but a rather relaxing experience. We wanted to dive in and see exactly what DXRacer FH11NB gaming chair was about and if it was worth the price tag. We did find a few surprising elements to this chair. Not only did we discover that it’s far more complex than it looks, but it is also far more comfortable than we’d assumed it would be. At first glance, the FH11NB does seem like your run of the mill race style chair. But, upon further inspection, you will start to notice how well DXRacer has paid attention to detail and have added some very important touched to improve comfort substantially. As far as comfort goes, we wanted to start with one of our main problem areas of the DXRacer Office Chair, the armrests. When it comes to comfortable arms and elbows, most gaming chairs don’t deliver and actually struggle in that area. What was so great about the DXRacer FH11NB was that you could actually adjust the armrests which took a lot of strain off of our shoulders and upper arms. I find that the extra padding in the armrests really accentuate the firmness of the plastic underneath, rather than counter it. While this does have its ups and downs, I really prefer it this way. You don’t feel too much strain and fatigue after long hours like you would if the armrests are too plush, but you also don’t need to be as uncomfortable as you would be if the armrests were just straight up made of hard plastic. Being able to stretch out while still having enough of an angle to reach your keyboard and mouse also adds to how much we like these armrests. Also, there are nice padded footrests for people who like to lean their foot back into a position where they’d be sitting on the footrest. They were very comfortable and they feel great to the touch when you’re tiled back as well. A nice strong mesh was great to relax back in when DXRacer FH11NB gaming chair was in full tilt as the material didn’t sink in too low and still felt comfortable. 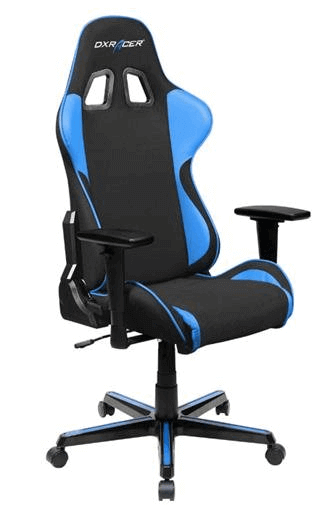 Black and blue is a pretty common trend among a lot of popular DXRacer gaming chairs, especially ones like DXRacer. However, if you’re not too keen on the black and blue color scheme, you can get a lot of other different color schemes from the manufacturer and most of them don’t come with an additional price. With the design of this chair, it’s very comfortable in terms of leaning back. DXRacer likes to give their customers a wide range of personalization options to choose from. With this line of chairs, however, you’re pretty much limited to being able to choose from a selection of colors. While we do miss getting a say in what casters we get or being able to customize armrests or lumbar supports, we must say that we really do like the color options available on this chair. DXRacer really does know what they’re doing when it comes to designing their chairs visuals, and all of the vinyl schemes look equally awesome. This is in part due to the angle adjuster when you’re leaning back. The base of the DXRacer FH11NB chair has these specially aligned footrests that cover a long strip down every single leg of the base that we enjoyed. When we kicked our feet upon them, we had no problem relaxing and they were comfortable to the touch. The base of the DXRacer FH11NB is relatively strong so we weren’t too worried about the overall durability of the chair. How did the chair and the back hold up though? When we tilted back at a nice 180 degrees, the chair held up, it didn’t break or crack and it didn’t give us any jump scares with noises indicating that it might break. It was solid and smooth when it came to leaning back and the armrests held up great as well. The pieces were adjustable and we tried every single position to see if there was any weak spot in the armrests when it came to durability. We couldn’t find any. The gas spring cylinder lasts much longer than any hydraulic or compressed air system. Other parts of the chair are more likely to break down or wear out long before that system will leak and end up having you sink down and constantly need to readjust your chair. DXRacer takes safety very seriously when it comes to their customers. The gas piston and base are both rated to be able to withstand large amounts of weight. The gas stand itself is rated at category 3, allowing for it to safely withstand up to 400lbs of force. DXRacer also has a pretty good customer warranty plan, and they offer a rather thorough warranty on all parts and the chair as a whole, should something go wrong. While the warranty doesn’t extend to a lifetime, it does apply to any damage that the chair receives within two years of its purchase. Extra Cushions Included – If you’re like us, you need to make sure you have a nice headrest spot or something to help support your lower back. With the DXRacer Gaming Office Chair, there’s a nice lumbar support pillow and a headrest cushion that will fully support both your back and neck. These are removable if you feel like you don't need them. High Bracket For Your Head – With most gaming chairs, you’ll notice that your head kind of hangs off the top of the chair. With this DXRacer FH11NB gaming chair and a lot of other DXRacer chairs, we wanted to make sure that you could comfortably rest your head on the chair with your head being entirely supported. This chair did just that and was almost enough to put us to sleep. Design & Material – DXRacer FH11NB gaming chair came with an ergonomic design and the material was breathable. We didn’t have to wait after getting up for the PU foam to go back to its original shape before sitting down. It sprang back up quickly and was very durable. If you tend to overheat while sitting for prolonged periods, then the breathable material will help against that and keep you cool. Spine Support – This chair includes an extra high headrest so that you’re not bending your spine to help you see. The shape of the backrest will keep your back in alignment which helps your circulation. Good circulation gets more oxygen to your blood which will keep you alert and focused. If only more chairs did things like this and supported features like this. Easy Assembly - Assembling the DXRacer FH11NB gaming chair is pretty intuitive and the instructions are clear. You could probably do it yourself, but if you have somebody to help lift the backrest while you try to put it on the base then that would be helpful as it is heavy. All in all, it shouldn't take more than 20 or 30 minutes to put it together. You can pay extra and have the DXracer Office Chair professionally assembled if you don't want to bother or are afraid you might not set it up right. ​Q: Does the lumbar support pillow and headrest pillow come for free? A: Yes, the support pillows come for free which include a lumbar support pillow and a headrest pillow. They are removable if you don't want to use them. Q: I’m 6’ tall, will this chair accommodate me just fine? A: Yes. DXRacer chairs, in general, are known for having an extra tall neck or headrest. This is done to not only support the average users’ head but it’s also made for especially tall people so they can enjoy the chair as well. If not, there’s plenty of DXRacer chairs out there with adjustable headrests. Keep in mind that the weight capacity is 200 pounds, though you could probably be ok if you weigh a little more than that. Q: What special tools will I need to assemble the chair? A: All the tools needed for the DXRacer Office Chair come packaged up with the chair and assembly is relatively easy. You can be done in a few minutes. The tilt mechanism on DXRacer FH11NB gaming chair comes with different angles and even an angle adjuster. It’s fairly easy to use and once you get the hang of it, you can easily lean back into a comfortable reading or sleeping position. The footrests, while they may not be beneficial to a lot of people, are a nice extra added touch to the design and compliment the DXRacer FH11NB gaming chair quite nicely.